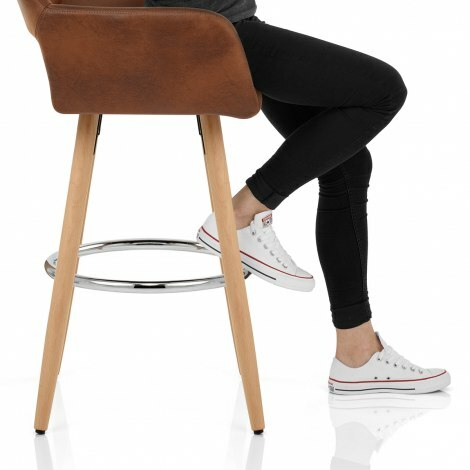 The Kite Wooden Stool Antique Brown will bring a combination of rustic charm and modern elegance to your bar area. A completely unique item of bar furniture, the Kite Wooden Stool enhances its surroundings with a touch of originality and charm. 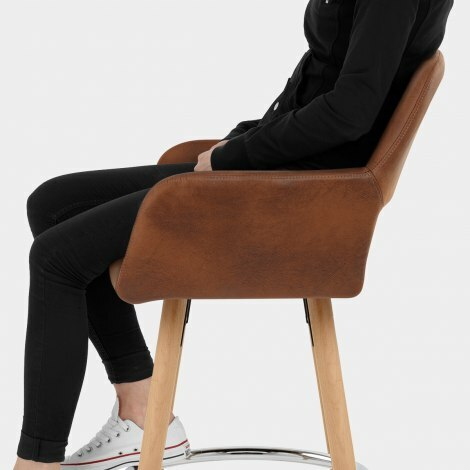 Comfortably padded, the seat is covered in antiqued brown faux leather for a vintage vibe, whilst a 360-degree swivel feature allows you to turn when seated, unlike any other of our four-legged designs. 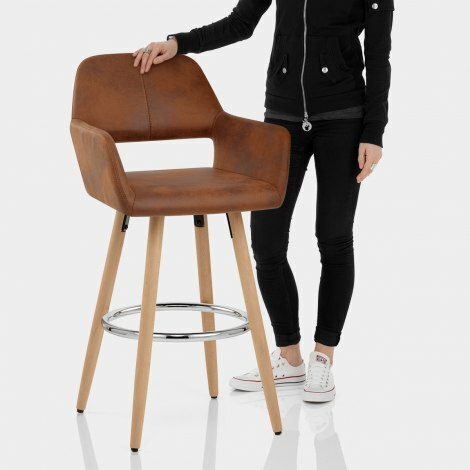 The encompassing seat includes curved armrests and a high supportive backrest with a cool cut out detail incorporated. Not only stylish, this detail prevents this model from taking up too much visual space. The sturdy frame comprises four oak finished legs, connected by a chrome circular bracing bar that delivers a contemporary flair. Each leg is finished with an adjustable protective plug, allowing you to use the Kite on an array of floor surfaces. "Comfortable and stylish and easy swivel"
Lovely quality, go great in my kitchen and fast delivery. Have had loads of people asking where I got them. Very pleased. Exactly what I was looking for ! Went perfect in my new kitchen, very comfortable, + look very stylish + expensive! Great value for money. Would definitely recommend. Prompt delivery and absolutely love them. Easy to put together and look fantastic in my new kitchen. Would definitely recommend this company and will be buying again. Thanks for a great service. We love our new stools. Easy to put together, lovely looking and practical.